Giveaway: Gift Pack of Natural Goodies from Wow Summit! Ok, so if you follow me in Instagram, you saw all my pictures over the weekend of the fun and excitement that was Moms Meet 6th Annual Wow Summit. Looking refreshed after a mid-afternoon nap! One of the perks of the summit, besides learning how to be a better blogger, and listening to great speakers like Dr. William Sears, was to meet with new brands and sample products. The brands loaded us down with tons of awesome goodies to bring home to sample in our families- and of course to share! I filled one of the reusable shopping bags they gave us with all kinds of stuff: candy, food, samples, beauty products, healthcare samples, personal care, and more! Solgar, Table5 Pizza, National Peanut Board, Nestfresh, PlusCBD Oil™ by CV Sciences, Sambucol, Vitamin Friends, Wild Planet, Boiron, Bundle Organics, Child Life, Flora, Herb Pharm, Hippo Sak, Lindsay, Malaysian Palm Oil, Mum-Mum, Natracare, Organic OCHO Candy, Regular Girl, Don’t Go Nuts, Earth Science, Little Duck Organics, Mabel’s Labels, MacroLife Naturals, Scholarshare529, Sola, TruthBar, Motherlove, The Honest Kitchen, NOW, Stork Bites, & Juicy Jems. Entering is easy: Leave a comment on this post. I’d love to know what Natural Product from the list above you are most excited to try. This contest is open to the US only. I’ll chose a winner on 11/12/18! Some of you may not know this, but before I blogged about frugal living and my family adventures, I was a costume designer. I made and sold costumes for a living. All kinds of crazy stuff: Corsets, Harry Potter Robes, Jedi Costumes, Roman, Egyptian, Biblical, and Renaissance. Heck, once I made a Prince Charming costume for a groom to surprise his bride with at the reception. Last year, my husband decided that he wanted to put in a bid to direction a production of Romeo &Juliet with PowPac and co-produce it with Pickwick Players. His bid was accepted, and the magic began! Many hours go into the production of a play. I was lucky enough to design the costumes for the cast. I love creating costumes that suit both the actor and their character. Small details that reveal more of the characters.. well character. Colors, fabrics, and the lines and fit of costume can really reveal a lot about a characters motives or intentions. Here is an article that was published in the San Diego Union Tribune about the show. I am also lucky enough to sponsor a giveaway for a pair of tickets to the show. Entering is EASY PEASY. All you have to do is leave a comment with your favorite play of all time. It doesn’t have to be Shakespeare either. It can be the Spongebob Musical (yes, that’s a thing). I’ll select a winner at random at 7/19/18 about dinner time. Tickets will be held at PowPac will call under the winners name and are good for any showing of the play. Dunkin Donuts Keurig Kcup coffee giveaway From Cross Country Cafe! May 18, 2017 Abby H.
I love Cross Country Cafe. They have lots of great deals on Kcups, teas, coffees, and more! 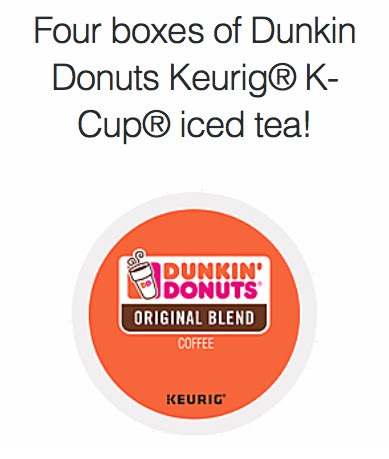 And right now, you can enter to win Dunkin Donuts Keurig Kcups! Monthly Keurig K-cup coffee giveaway- each and every month we will be giving away full size boxes of Keurig K-cup coffee to one lucky winner! Contest ends May 31, 2017 at 12:59 pm EDT at which time one random winner will be chose and announced within 48 hours. So GO ENTER NOW! And if you are worried about Kcups in landfills, here is a great Pinterest board with tons of great crafts! April 25, 2017 Abby H.
You know I love a good Gift Card Deal! Right now through April 29, 2017 when you purchase $300 or more in Mastercard gift cards at Staples you will receive a $20 Staples gift card by rebate. See store for more details, find your local Staples here. What is great about this deal is you can choose different denominations of Mastercard Gift card to reach the $300. There are so many great ways to work this deal! Use your points or cash back credit card to purchase the gift cards for a double dip! Our American Express Card gives us 5% cash back when we shop at office supply stores. Pick up gift cards in smaller amounts ($25) and give to your child’s teacher to help with supplies a few times before the school year ends. Did you know that teacher appreciation week is coming up?? Great for sending to college students or for graduation gifts! Use the gift cards to stay on budget for gifts and online shopping! Because you can shop in store or online with gift cards, it’s a great way to triple dip (use a cashback online shopping website like ebates or Topcashback to redeem your gift cards. You will earn even more cash back!). Right now, you can enter to win a $50 Amazon Gift Card! Stock up on essentials for upcoming spring break, or buy yourself something nice! Click here to enter (the Rafflecopter may not be mobile friendly). March 13, 2017 March 19, 2017 Abby H.
You know I love a good Gift Card Deal! Right now through March 18, 2017 when you purchase $300 or more in Visa gift cards at Staples you will receive a $20 EZ Rebate. See store for more details, find your local Staples here. What is great about this deal is you can choose different denominations of Visa Gift card to reach the $300. Pick up gift cards in smaller amounts ($25) and give to your child’s teacher to help with supplies a few times before the school year ends. Great for sending to college students! Enter to Win a $50 Amazon GC! I am so glad that I’ve been able to grow my social media presence organically, meaning, just by word of mouth. And now I want to thank my followers, however they discovered me! To celebrate 500+ Instagram followers, I am giving one lucky follower a $50 Amazon Gift Card! Leave a comment on this post with your Instagram handle. For a bonus entry, share this blog post. Leave a comment as to how/where you shared it. You must be an Instagram follower to win (and yes, I will check). I will choose a winner on 1/31/17. Winner will be notified via Instagram and/or email. Giveaway: Enter to Win Two LegoLand California Park Hopper Tickets! I am so excited to share these tickets! As a LegoLand Blogger, I am given two free Park Hopper tickets each year. I can use them myself, or give them away. I’ve decided to give them away. I want one of you to experience the fun of Legoland! This pair of tickets expires 12/31/16, so you still have a while to go and experience the fun of Legoland California! If you haven’t been to Legoland, it’s a great way to spend a day! There are tons of fun things to do: Rides, Shows, and of course, stations to build and play! We love the build and play area next to Heartlake City. It has a Duplo Theme. There is a playground, and in the playground you will find various stations where kids (and grown ups) can build whatever you’d like! If you are looking to save some money, I recommend that you take a bottle of water (at least one). All of the snack stations/restaurants will refill your empty bottles. We take our Camelback bottles. The kids have these smaller bottles, and hubs and I have these larger bottles. We also take snacks to munch on throughout the day. Family favs include: Apples, orange slices, fruit snacks, crackers and seed butter, protein bars (we are currently digging on Balance Bars). However, we do splurge on the Apple Fries- They are sooooo good! To enter to win the pair of Legoland California Park Hopper ticket, please use the Rafflecopter widget below (or visit here). Please note that it is not mobile friendly, you need to enter from a desktop!